Today was the last walking day of my holiday – I originally planned to walk for a couple of hours tomorrow, but need to get back sooner. Chris joined me again today – we were dropped, very kindly, by Rita at Newhaven and walked through the back streets to the sea front. 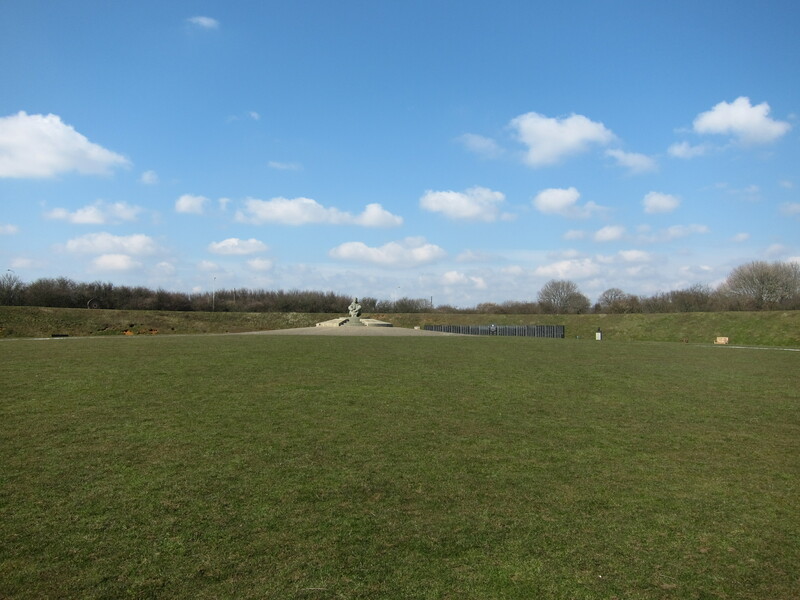 Unlike yesterday, the weather was fabulous – bright blue sky and a temperature that enabled me to walk without gloves or hoodie! 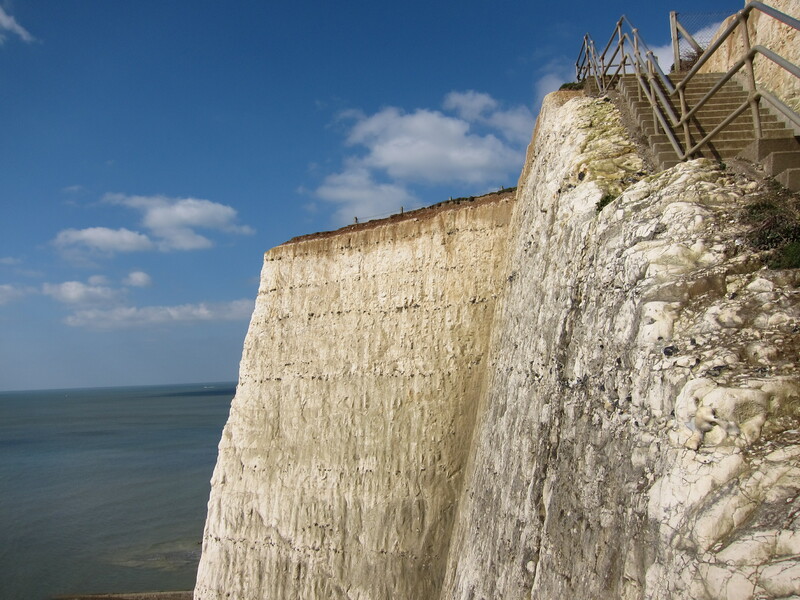 It is possible to walk from Newhaven to Rottingdean on the Under Cliff Path, which is part of the sea defences, skirting the white cliffs just above the high water mark. 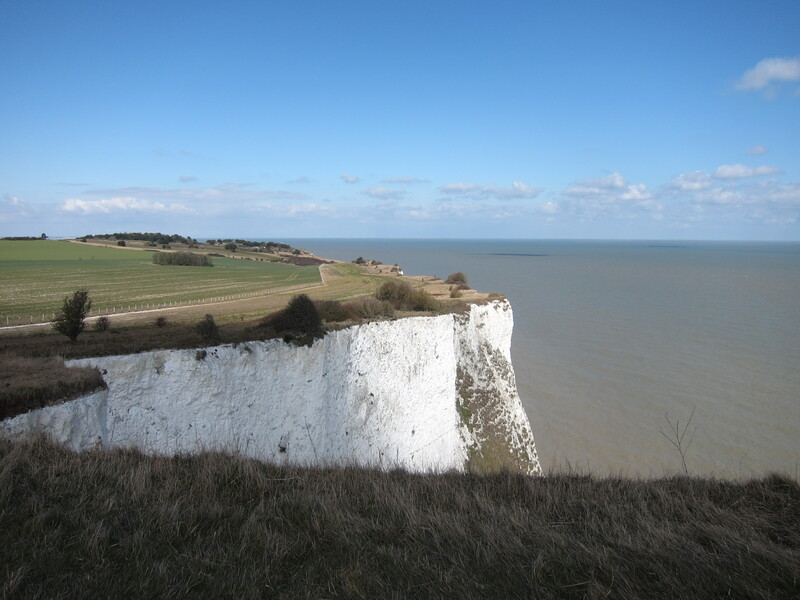 I was surprised to see that the limestone cliffs which I have always associated with the area around Dover extend so far. We walked for a couple of hours and then had to climb up to the top of the cliffs when the lower path ends. We took the opportunity to stop for a coffee in a pleasant pub. 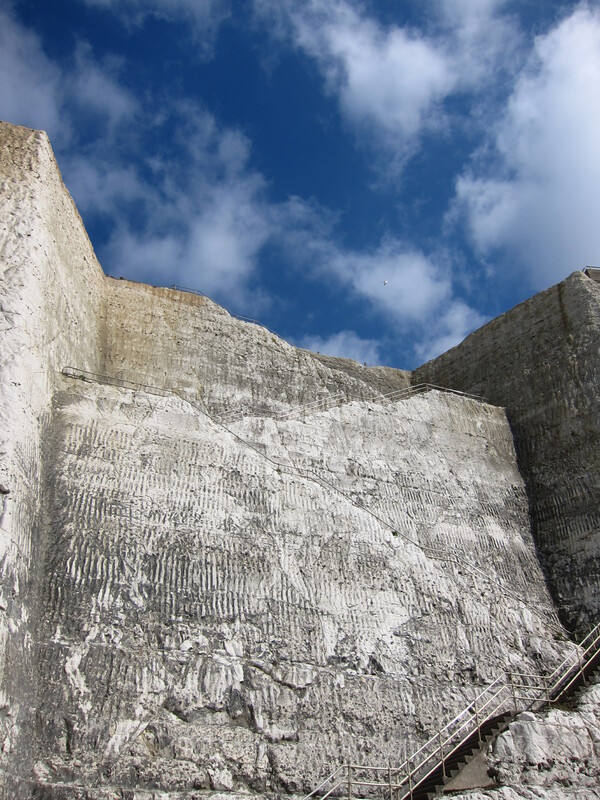 After about half a mile there are steps back down to the lower path which continues all the way past Roedean and Saltdean to the marina at Brighton. This is a largish marina with a very impressive sea wall, along which we took an unintended detour. We then spent some time wandering around the Marina car park, looking for the path. 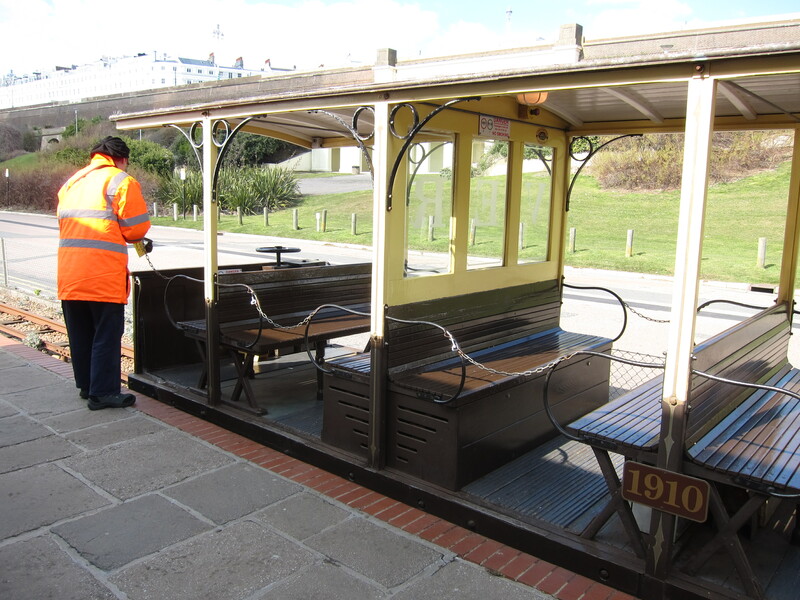 Eventually, we came across it, but we also found the Volk Electric Railway which carries holiday makers the mile or so between the Marina and the Pier. Unable to resist the temptation of a toy train, we leapt on. I left Chris at Brighton Pier, and continued along the front which was thick with people enjoying the first warmth of the year. 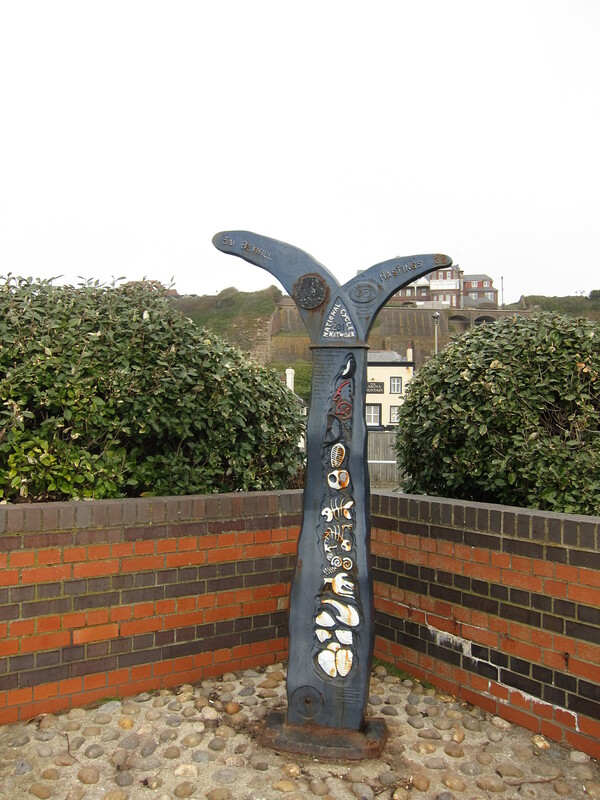 The sea front path continues past Hove, Portslade and Southwick to Shoreham Harbour which is lined with wharves and light industrial units. I was beginning to tire now, so hopped on the train at Shoreham, arriving back in Eastbourne at about 7pm. The 10 days have been fantastic and I am already looking forward to the next leg at May Bank Holiday – I need to plan the route in more detail and will upload in due course. Let me know if you would like to come. Today required quite a bit of grit to get going. We left the Dover bunker at about 8.45, having had a farewell breakfast in café Illy, and arrived in Eastbourne at 11.15. It was horribly cold and there was snow on the motorway as we drove along. I am amazed at how far I have walked in 4 days – next time, I shall change hotels on the third day, rather than the fourth – an hour and a half was a long drive before starting out. Our hotel in Eastbourne is better in some ways than Gulag Towers – there is wifi in the bedroom for starters and it is right on the sea front in a huge Victorian terrace. Unfortunately, one person needs to stand outside whilst the other moves around as the room is minute. Having parked the car some miles away from the hotel, owing to the very restrictive parking regime, I jumped on the train at Easbourne, (carelessly leaving my gloves behind), while Bridget decided to have a day of rest. I think in future, I will arrange a day of rest after a week, as I was quite tired today. The train arrived at Hastings within the half hour, and, allowing for a detour to buy replacement gloves (although, fortunately, my old ones had been rescued and tucked into the ticket vending machine at Eastbourne when Bridget kindly went to look for them) I started walking at just on 1pm. Hastings is not hugely exciting, and its adjacent suburb St Leonard’s is positively depressing – lots of youngish men hanging about with the whiff of illegal substances hovering over them. 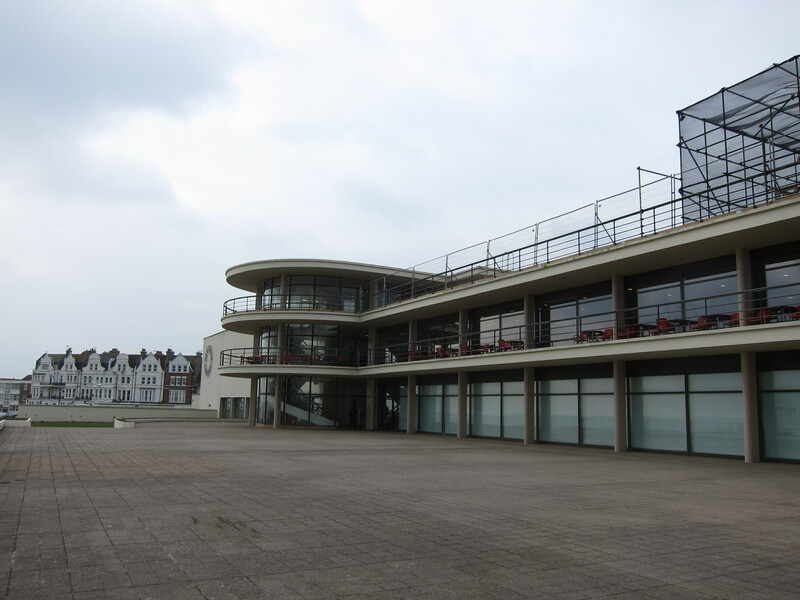 I walked along the front to Bexhill-on-Sea, which is slightly more sedate and attractive with the landmark Pavilion building in classic 1930’s style. Poirot was nowhere to be seen, however there was a Mr Whippy van, with a driver who looked as though he hadn’t had a customer since last August Bank Holiday, so I decided (since it was such a balmy day) to have an ice-cream. My stomach felt extremely peculiar for at least an hour afterward – presumably the effort to adjust my body temperature to compensate for a chocolate Feast on a day when the thermometer was stuck below 3 degrees centigrade. All of the shore in this part of the country appears to be shingle – I am not sure why it is so popular, as very difficult to walk on. Some 3 miles out of Bexhill I reached Normans’ Bay, on the outskirts of Pevensey, where William the Conqueror landed some 950 years ago. I hope he had warmer weather. The path then disappeared between rows of 1920s built bungalows and summer houses before drifting unenthusiastically into Eastbourne. I returned to the hotel to find Bridget diligently working, sitting in the glazed verandah of the hotel. We went out for an excellent meal (see review.) I have now completed more than 210 miles! Today was planned as a shorter day, after the last two quite long days, however, it was one of the hardest days so far, because of the very hilly coast around Hastings. The weather continues dry, although there was a brief snow flurry at the end of the day, and the wind is sharp. For much of the walk we were sheltered on the north side, so did not suffer too much from the breezes. 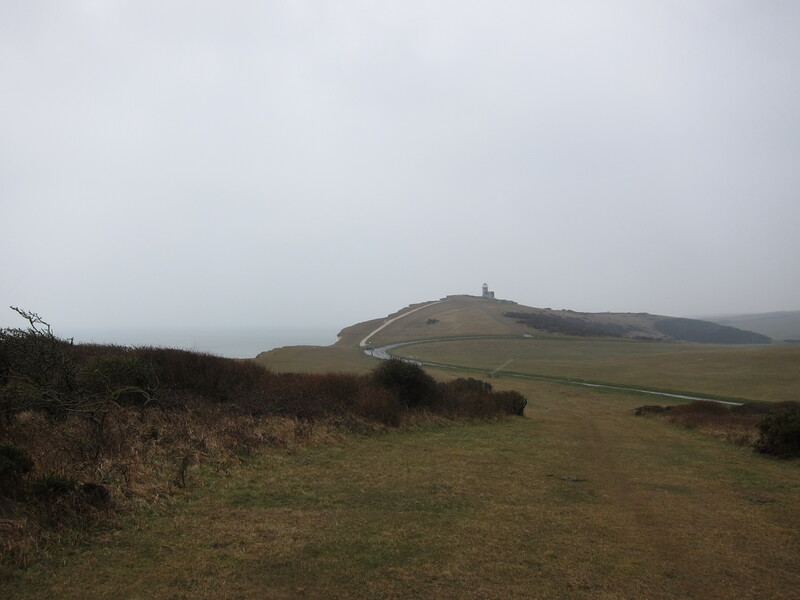 We set out after a late breakfast in our favourite Dover café, followed by a drive back to Rye. We continued to follow the Royal Military Canal path, which overlaps in part with the Saxon Shore Way. 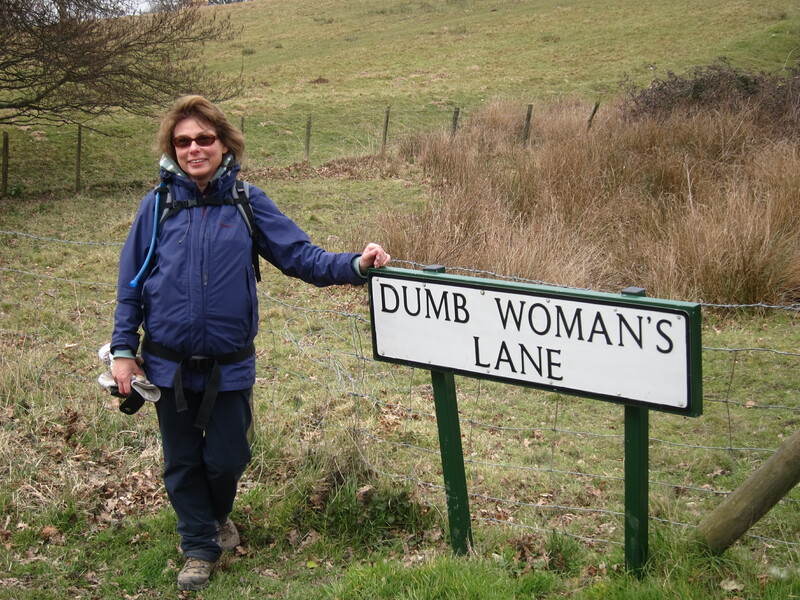 After some 3 miles of walking (down Dumb Woman’s Lane!!) we reached the gorgeous town of Winchelsea, up on a bluff, overlooking the coast. 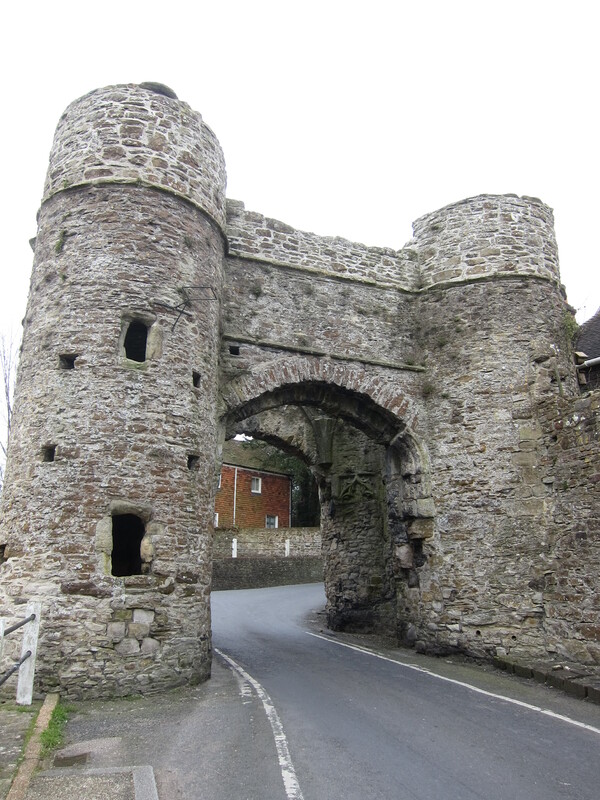 The town itself, once directly on the coast, still has three mediaeval gates, and the remains of St Thomas’ Church, destroyed by the French in the middle ages. We stopped for lunch (see review) then continued along the flat canal path to Cliffs End on the coast. This is where the pain began! The path climbed up to Fairlight (a very dull dormitory town of bungalows, reminiscent of the older suburbs of Sydney with pristine bungalows and elderly men mowing already neat grass) and then to the top of the cliffs at the Hastings Country Park. 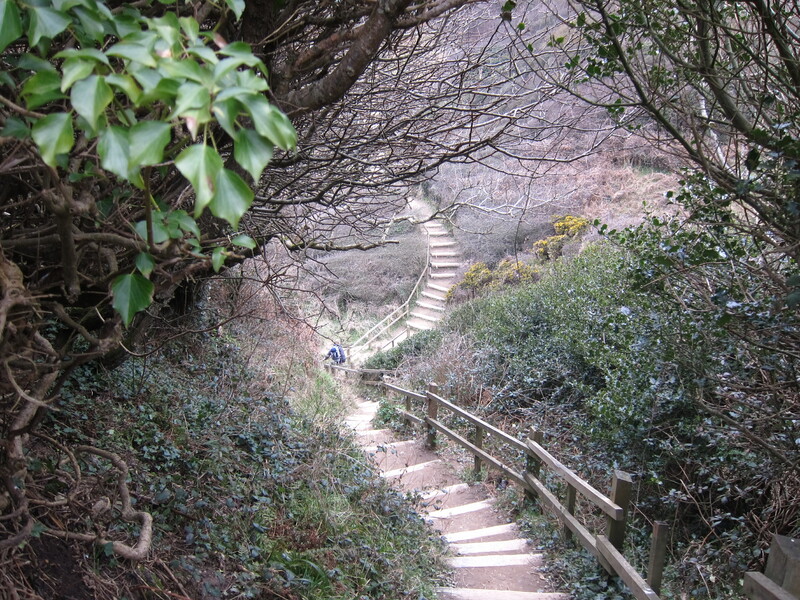 For 5 miles the path climbed up a cliff, then dropped sharply down to a ravine, then up another cliff, and down again. Bridget’s feet were suffering and my knees were getting very fractious by the time we arrived in Hastings. 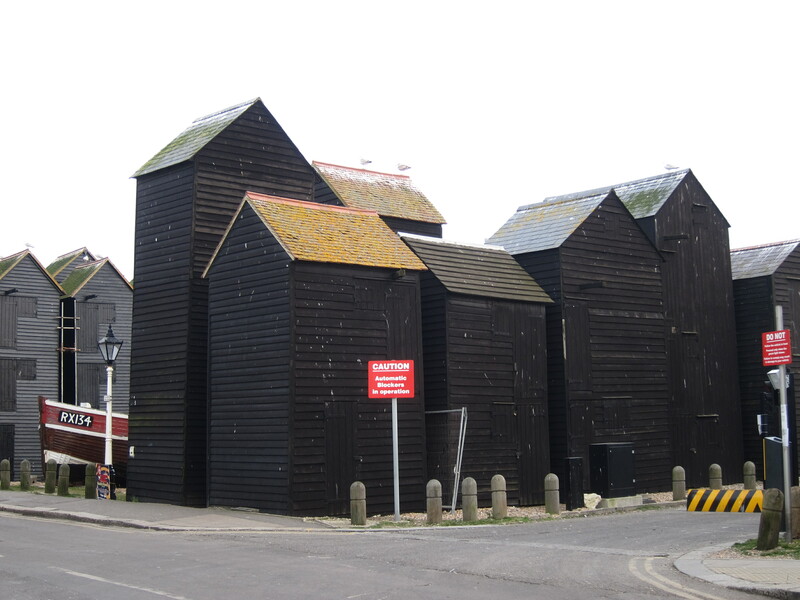 The old town has some rather nice buildings, including some interesting sheds which apparently are used for making, storing and drying fishing nets, but the majority of it is faded Victorian seaside with amusement arcades at every turn. 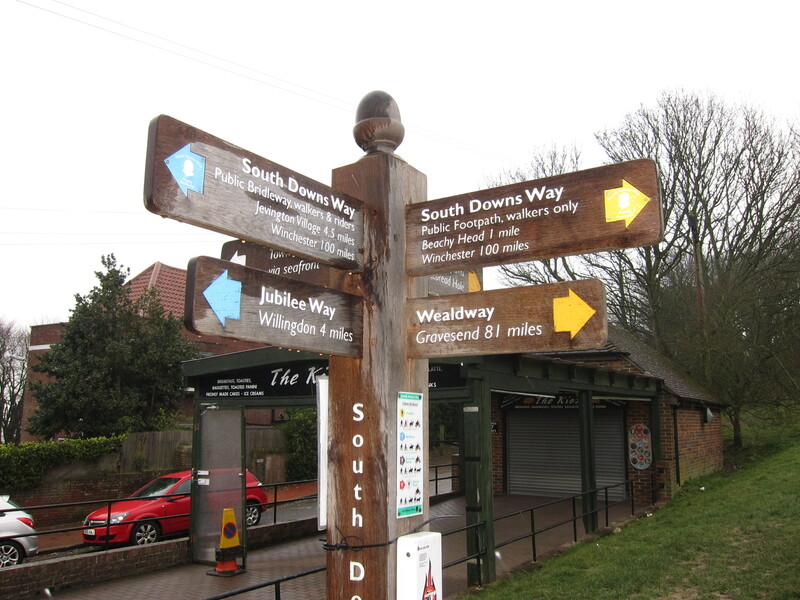 I have now completed the whole of the Saxon Shore Way, from Gravesend to Hastings. We took the train back to Rye, where we had an excellent dinner, before returning to Dover for our last night in Gulag Towers. We set off from Gulag Towers, after breakfasting in Café Illy again and parked the car at West Hythe, where we finished yesterday, prior to our detour to find some supper. We decided to stick with the canal route along the Royal Military Road because we thought it would be much pleasanter than going on the road down to Dymchurch and then road all the way to Rye. It turned out to be an excellent choice. The scenery did not vary hugely, but it was pleasant and easy walking beside the canal, sometimes with an avenue of trees to protect us from the evil north-east wind, other times across the edge of wide open fields. We saw a couple of herons, and also several swans, sitting in the middle of fields, which seemed odd, as I had assumed that swans nested on water. 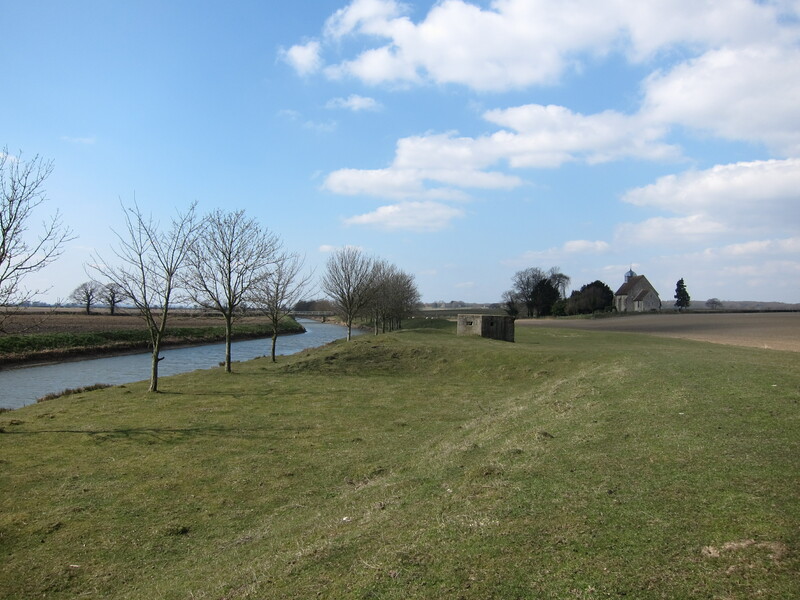 The Royal Military Road and canal stretch for some 28 miles, with a pill box overlooking a dog leg in the canal about every mile, and a crossing every 2 – 3 miles with the old crossing keepers’ cottages still in evidence. 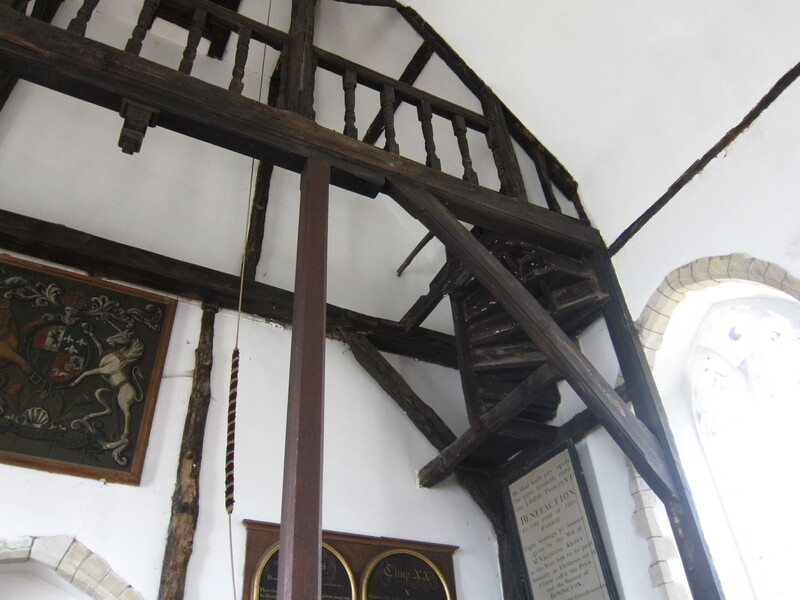 On the inland side (north) a series of mediaeval churches lined the route, and to the south the expanse of Romney Marsh stretches down to the sea. 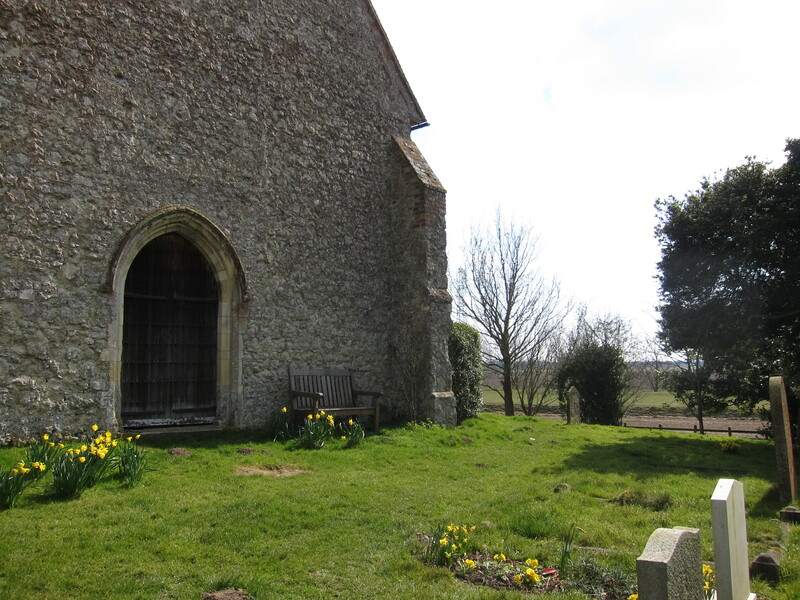 We stopped for lunch in the churchyard of St Rumwold’s, Bonnington an absolutely gorgeous little church dating from the 13th century. The wind was still fierce, but we sat on the West side to chomp our way through a bag of olives and some cheese and tomato – not forgetting the pistachio nuts and the Green & Black’s chocolate. Inside the church much of the structural woodwork was still visible, including the stairs up to the bell tower. The path continued to meander beside the canal. The sun was warm on our faces, and there was hardly a cloud. We arrived in the quintessentially English village of Appledore at a few minutes to four. We had been fantasizing about the possibility of finding a quintessentially English tea shop, and that is just what was there – Miss Mollett’s tea rooms. Unfortunately, she closed a few minutes before our arrival so we were constrained to visit the pub instead, where Bridget sampled the local ale – apparently very good. 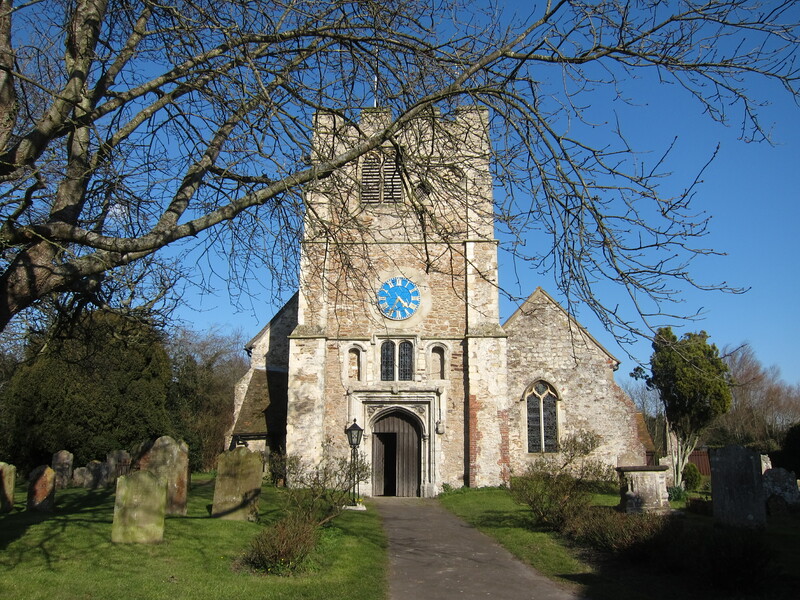 Next to the pub was the church of St Peter & Paul, which was another beautiful mediaeval church – rather larger than St Rumwold’s but no less attractive. The parish ladies sell jam and various other items of local produce in the church to raise funds for restoration, and Bridget purchased a chocolate Easter nest. Next to the church, an elderly lady was gardening – the whole village looked like a set for Miss Marple. 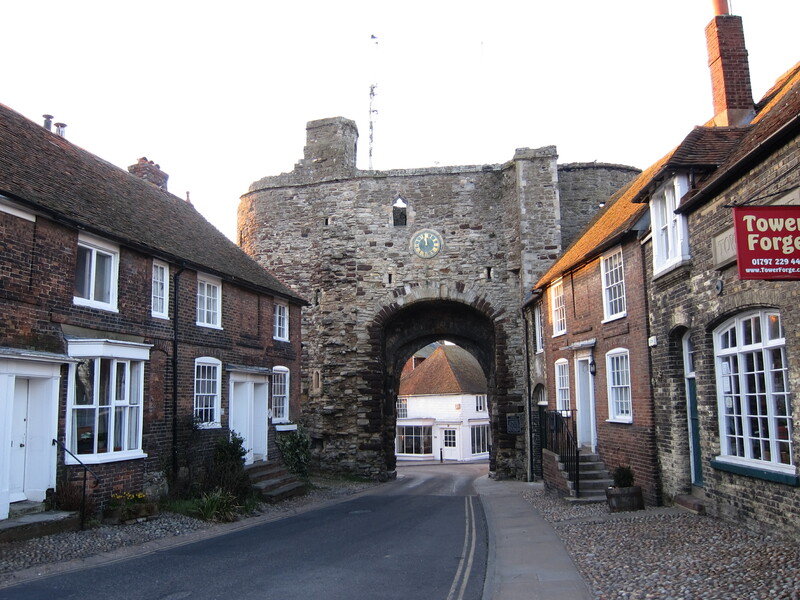 We arrived in the charming town of Rye just before 7pm. Rye is another of the Cinque Ports, on the very edge of Romney Marsh, home to smugglers and immortalized in the weird tale of Dr Syn. Unfortunately, the hospitality is less charming than the architecture. In our first choice we were told the place was completely reserved, but we formed the impression that our less than pristine appearance made the waiter fear that we would lower the tone. The other pubs seemed equally full of reluctant staff. 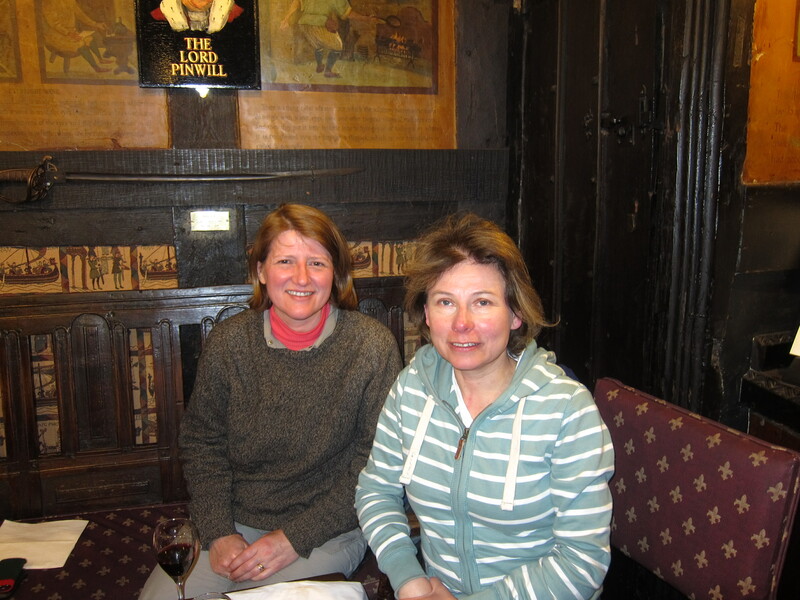 Eventually, we had a good meal at the ancient Mermaid Pub – dating in parts from 1156 and rebuilt in 1420 after the French burnt it down in 1377. It is extremely p icturesque, perched at the top of a cobbled lane but a bit self-satisfied. We took a taxi back to West Hythe to fetch the car and were pleasantly impressed by how long the journey took. 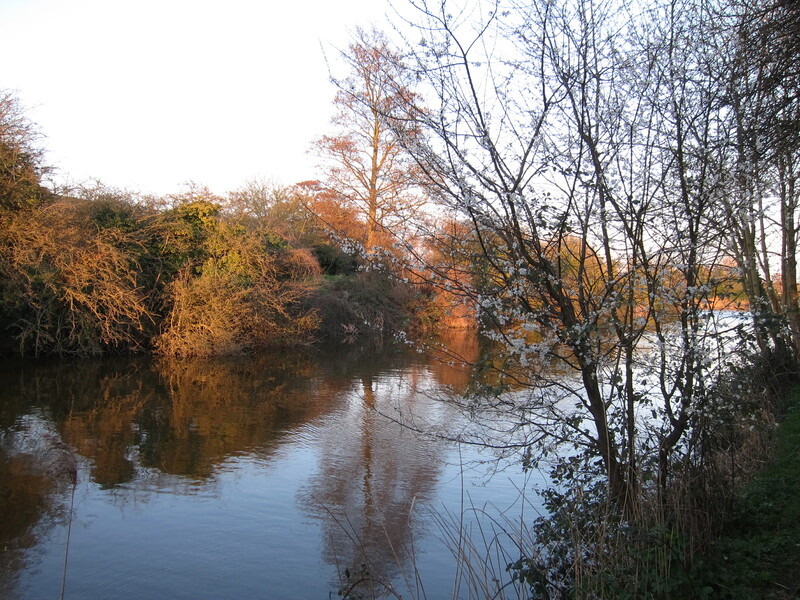 I strolled along, enjoying the bright sunshine and the spring blossom, watching the courting ducks and being amazed at the wide variety of dogs being walked – incidentally, since when have coats become de rigueur for dogs? After leaving Sandwich, the path goes directly back to the coast, over a golf links. The sea looked very grey and a harsh east wind sprang up as the sky clouded over. To my left, I could see Ramsgate, and to the south, Deal. The path goes straight along the shingle for several miles until Deal is reached. Not much to say about Deal – another shabby seaside town, whose history is inextricably linked with Nelson and the Napoleonic wars. Apparently the British fleet was anchored in Deal Downs, and Nelson stayed often in the Royal Hotel (accompanied by his great friends, the Hamiltons!). 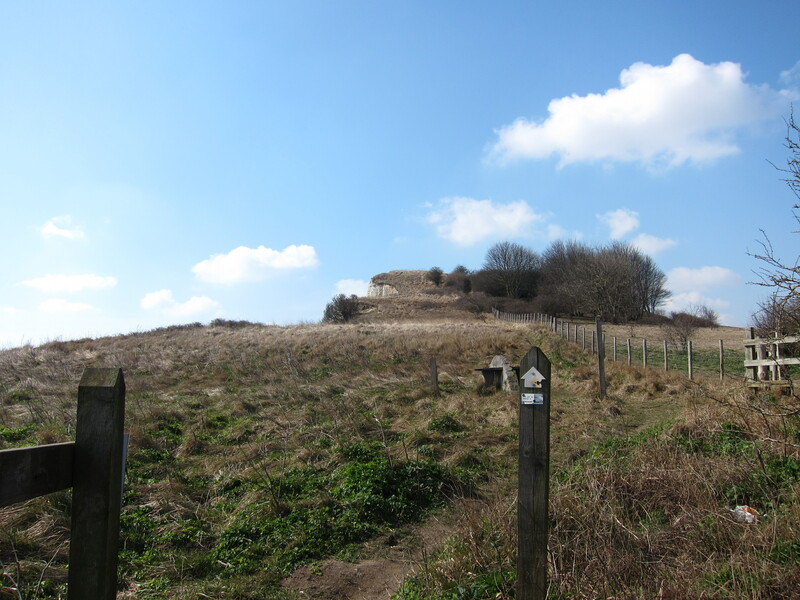 The remains of Sandown and Deal Castles punctuate either end of the promenade. The former now concreted into the retaining wall, the latter still looking pretty intact. 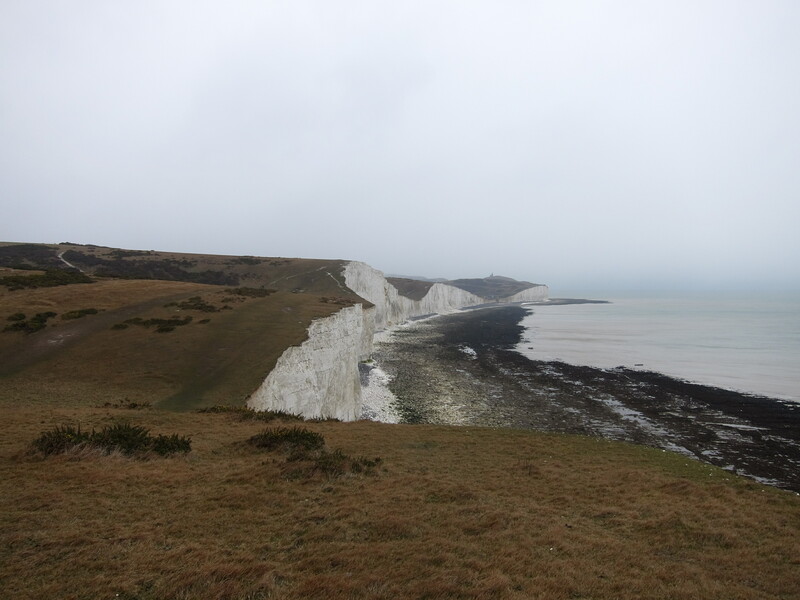 Walmer is a continuation of Deal, but once you are through it, the path climbs up onto the top of the cliffs, and the next 8 miles were an absolute delight. As I turned South-West, the East wind dropped and I could feel a much warmer South-West wind on my face. The sun came out and I peeled my neck warmer and gloves off for the first time since the walk began in January. 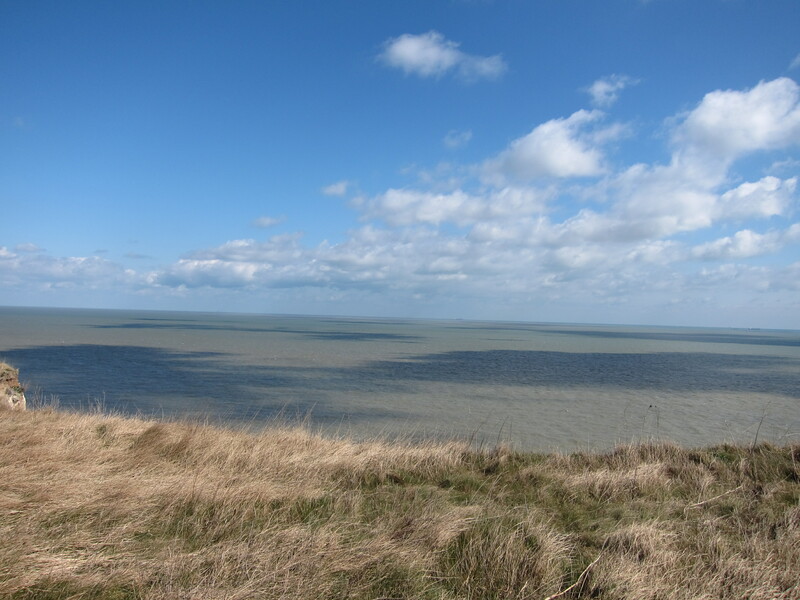 Down below, I could see the ferries going in and out of Dover, and on the far horizon, the shores of Normandy. The path drops down to the shore at St Margaret-at-Cliffe, where there was a massive cliff fall last week – you can see the chalk heap in the sea (picture.) This tiny port is the closest point to France, and is the place where the cross-channel swimmers start their crossing. 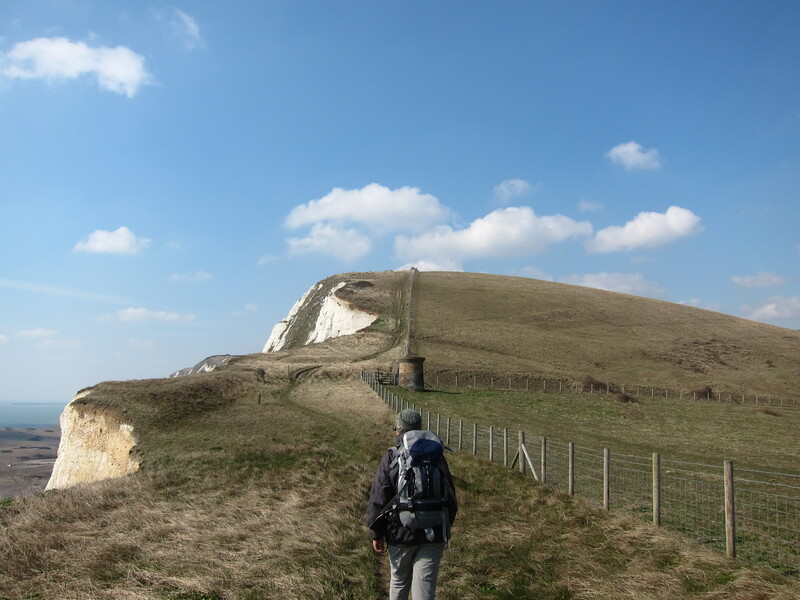 Back up onto the cliff top and a lovely stretch to Dover – hundreds of people around enjoying the first Spring sunshine. I took the 17.03 back to Sandwich to fetch the car, and am now waiting in the (absolutely dire, 1970’s concrete monolith) hotel for Bridget.